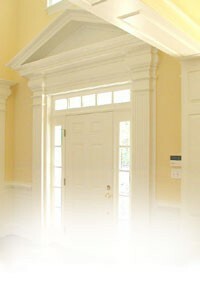 Entrance Hallway: 15 x 6’7” Crown mouldings. Coat closet. Side-lights at front door. Formal staircase to large unfinished second level. Living Room: 20’2” x 15’ Crown mouldings. Masonry fireplace with marble hearth and surround. Decorative mantel. Arched built-in book cases with cabinetry below. Dining Room: 15’ x 12’5” Crown mouldings and chair rail Custom shelving with cabinetry below. Chandelier, original to the house. Family Room: Masonry fireplace with raised brick hearth and surround. Gas logs. Bay window. Custom shelving with storage below. Beamed ceiling. French door to rear garden. Custom mahogany doors with antique English stained glass opening into sunroom. Storage closet. Entrance to full bath. Kitchen: Fully renovated by Franko Construction in 2015. Natural cherry cabinetry with many special interior features, which include tray drawer, knife drawer, two-level cutlery drawer, and built-in dog-bowl station. Nickel hardware. Stainless countertops with unibody, seamless stainless 8-degree sink. Brizo touch faucet. Bosch stainless dishwasher. Wolf four-burner gas cook top. Wolf electric grill with vent hood above. Wolf electric wall oven. Wolf warming drawer. Glass tile backsplash with Italian glass detail above cooktop. Under-cabinet LED lighting. Recessed lighting plus light fixture above island. Dual-use island with stainless cooking prep area and eat-in bar with “exotic-grade” Golden Cobra marble countertop. Built-in wine rack. Under-counter stainless Sharp microwave drawer, bread drawer, and two Sub-Zero refrigerator drawers. Garbage disposal and Brizo touch faucet. Wet bar with Golden Cobra countertop. James River gray cabinetry with lighted glass-front doors and drawers below. Cabinetry with media center. Stainless Sub-Zero refrigerator with two freezer drawers. Wolf coffee system with mug warming drawer. Stainless Sub-Zero mini refrigerator with ice maker. Sunroom: 23’2” x 19’2” Open and bright! Slate flooring. Fireplace (furnace grade) with gas logs and individual thermostat. Built-in cabinetry. Two ceiling fans. Recessed lighting. French doors to bluestone terrace. Atrium door to rear garden. Guest Bathroom: Full bath with a ceramic tile shower in hallway beyond kitchen area. Laundry/Utility Room: Cabinet with granite top. Built-in shelving. Laundry sink. Master Bedroom: 17’6” x 15’2” Walk-in closet. Exterior door to rear gardens. Plantation shutters. Ceiling fan. Directly accessible to both bathrooms. Full Bath: Heated porcelain tile flooring. Large, accessible zero edge shower with stainless grab bars and teak shower mats. Rain head showerhead. Porcelain tile backsplash with glass accents. Radiator/towel warmer. Floating vanity with walnut veneer cabinetry. Marble top with ceramic sink and Delta touch faucet. Mirrored medicine cabinet. Recessed lighting with dimmer. Bedroom #2: 15’4” x 12’ Double closet. Plantation shutters. Ceiling fan. Bedroom #3: 15’4” x 12’ Double closet. Plantation shutters. Ceiling fan. Full Hall Bathroom: Heated porcelain tile flooring. Custom vanity with Swarovski hardware. Marble top with ceramic under-mount sink. Brizo faucet. MTI tub/shower with bubble jets. Two shower heads. Glass enclosure. Stainless grab bars. Radiator/towel warmer. Custom cabinet for linens. Custom shelving. Dual flush toilet. Recessed lighting. Sconces. Mirror shall be conveyed. Square Footage: 3,048 square feet per appraiser. (Prospective purchasers and/or their agents should confirm data). Approximately 1450 additional square footage in unfinished second level + attic storage. Heating: Gas hot water baseboard. Sunroom has furnace-rated gas log insert regulated by thermostat. Cooling: 3 zones. Front cooling replaced in 2016 and rear cooling in 2018.